1. Cook the tomato cubes along with all other ingredients numbered 1 for 6 – 8 minutes until frothy. Add cooked toor dal. Cook for 2 minutes and switch off. 2. In a small pan, heat ghee and splutter mustard seeds and cumin seeds. Fry dried red chilly and curry leaves. Pour this seasoning over the curry. Serve with rice and other side-dishes. 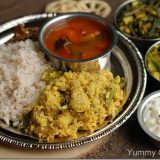 Maya: In the main picture, what’s the dry dish to the left of the Rasam? Looks like potatoes with kadala to me. 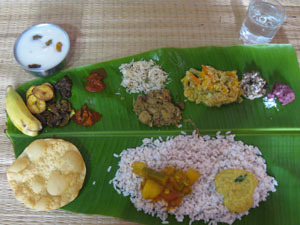 Thats vazhakka (banana saba) and van payar thoran..